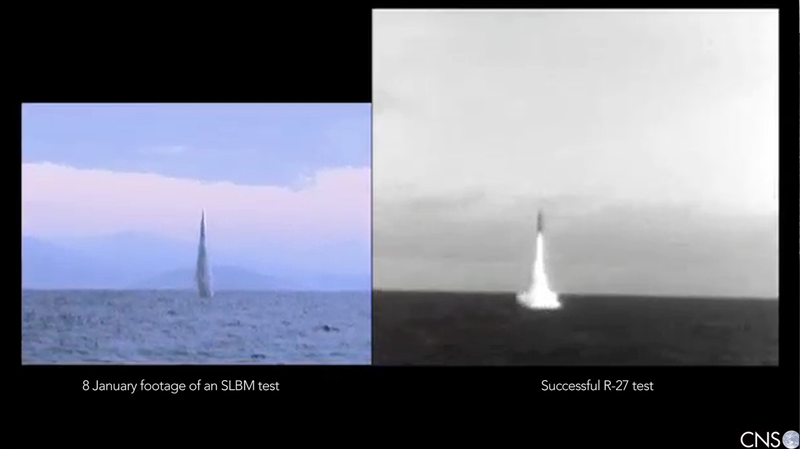 The DPRK released footage on 8 January from a purportedly successful KN-11 SLBM test. Based on the footage though, we have a pretty good guess. “It went kablooie,” as Jeffrey says. Along with several of my colleagues at the Middlebury Institute of International Studies at Monterey (MIIS)–Melissa Hanham, Bo Kim, Jeffrey Lewis, and Dave Schmerler–I created a video analysis, embedded below. Although the KN-11 appears to eject successfully, which is an improvement over November, we think that a catastrophic failure occurred at ignition. The DPRK has manipulated the footage in an attempt to obscure this result, but one clip plays for two frames too long. The rocket appears to explode. Compared to Soviet-era test footage of an R-27 launch–the KN-11 is based on the R-27–the failure seems clear. Dave geolocated the test to approximately 7 km west of the Sinpo Shipyard using the mountains along the coast. Sinpo is the location where the SLBM program is based, hosting a launch stand, a barge for underwater launches and a submarine outfitted with launch tubes. Our best guess is that this footage is from December, based on the report that the KN-11 successfully ejected. The footage, as released by KCTV, is heavily edited as a montage of brief clips. The launches are either slowed down or sped up. One clip is a mirror image of another. North Korea also appended footage of a successful Scud launch to give the impression of the missile soaring into the sky. Sorting out these clips to determine that they all showed a single event was time consuming. But when viewed against one another, it is clear North Korea only has a few seconds of footage of a single launch attempt. That attempt appears to have ended in failure. Here is a comparison with a successful Soviet R-27 launch that illustrates what we think happened. Although the KN-11 successfully ejects, it does not ignite. The Soviet R-27 is already ignited. The KN-11 appears to belch black smoke. The Soviet R-27 is now underway. The KN-11 ignites with what appears to be an explosion. The KN-11 appears to experience a second explosion. The KN-11 appears to experience a third explosion. The KN-11 appears to rupture. Ejecta are visible in the video. There are a number of cautions to this sort of analysis. Some of our colleagues wonder how closely the KN-11 resembles the Soviet R-27 and whether the ejection system is the same. We had hoped to examine this hypothesis, but the number of anomalies means at this point we can’t yet tell what the missile was supposed to do. And, of course, the footage looks nothing like what the DPRK released in May 2015. We all thought that looked more like an animation than real test footage, a conclusion that seems even more unavoidable now. But that is a subject for a future post. Pogo – big Pogo outside of the combustion chamber – it would appear that fuel and oxidizer mixing occurred outside the missile possibly with entrainment of turbo-pump exhaust. I like the string of pearls analogy as can be seen in the discrete ‘puffs’ expanding. Nice analysis – any measuration on the size of the ‘explosions’ to guess at how much fuel-oxidizer they represent by displaced atmosphere? That’s a good idea, I hadn’t considered. I am very interested in video analysis of explosions. The tough thing about this particular footage is that even in the longest slip, it cuts off before the completion of the explosion. Also, the North Koreans actually sped up and slowed down parts of the clips (making it a nightmare for Catherine to piece back together). Excellent work, all of you. I caught the switch to a different missile for the flyout, but missed the few frames of incipient explosion. Next question: Does anyone here have any color images or video of an R-27 launch? Based on plume coloration, I have moderate confidence that the KN-11 isn’t using the R-27’s UDMH/NTO propellants and is thus probably a standard Scud engine shoehorned into an SLBM testbed. If so, that would mean the ignition sequence is different (presumably slower for a Scud), making it hard for a direct comparison to tell us where the failure really began. A direct comparison to other Scud tests isn’t terribly helpful because other Scud tests happen at ground level and the missile base is enveloped in the backwash for the critical period we’re looking at here. John; imperfect combustion / early stoichiometry issues mean that plume color does not admit clear separation between IFRNA/Kerosene and UDMH/NTO. Scud run-ups are terribly imprecise, from starter fuel to takeoff thrust can vary by seconds. We have true color scud plumes at all phases of flight and the most interesting part is the ability to see the inhibitor in the flame color. Flames – Can you source the engineering behind the statement that “the Russians went for a hot launch in a flooded tube” as the DPRK apparently got some used Golf boats for scrap metal and that would be the OEM tube and launch means for what looks like an OEM SS-N-6? I noticed the start of the explosion too. It looked like too much of a fireball to be part of normal missile ignition. Plus the immediate cut to another view. It is possible that the May launch was just an ejection test. At the 2:53 mark (video link below) it is possible to see a splash (between Un and anonymous cadre) in the water to the left of a larger spray cloud (seen to the right of Un’s head). It looks like the missile ejected and fell back into the water nearby. Missile seems to pitch over about 5 degrees at ignition and ejecta is clearly seen at the same time, plus the initial plume (at the bottom near the water), post ignition is asymmetric. Rumor is that Iran has a land mobile, likely canister, cold launched variant of the R-27 in service since quite some time. The difference in launch sequence between KN-11 and R-27 could be because Iran transferred that technology to North Korea. So the KN-11 could be quite different compared to the R-27 at launch. 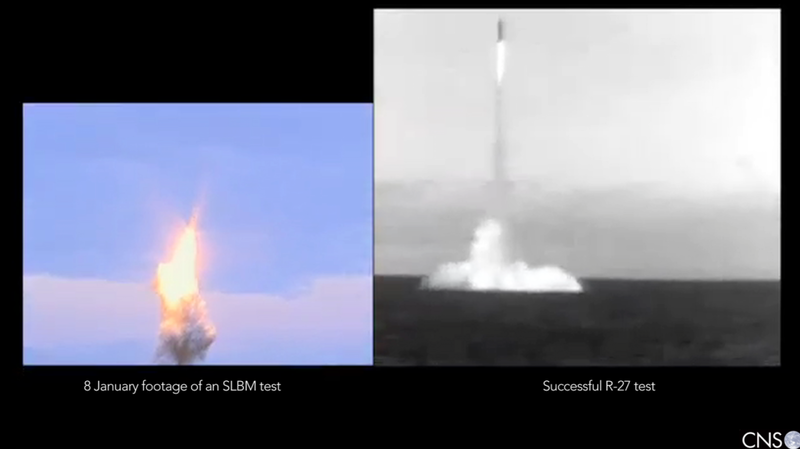 Hence I have some doubts whether this is really a failed launch or just a different technology.